The Bunburyist: Fast and Loose (1939). 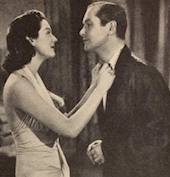 In Fast and Loose, Robert Montgomery and Rosalind Russell are husband-and-wife booksellers on the trail of rare book thieves. Other films in this series are Fast Company (with Melvyn Douglas, 1938) and Fast and Furious (with Franchot Tone and Ann Sothern, 1939).